So maybe you live in the area and always wondered about the trail, maybe you heard about it from a friend, maybe you’re visiting south Florida and want to do some hiking, maybe you’ve seen me at the Hobe Sound Beach with my backpack and trekking pole the smell of hiker trash consuming the picnicking area… and you ask yourself, where the heck did he come from? In this post I’ll try and answer questions I get a lot, concerns, and hopefully help you to be successful in hiking the OTLHT from end to end! What is the Ocean to Lake Hiking Trail? A 63 mile spur trail of the Florida Trail starting at Lake Okeechobee roughly in the center of the state that takes you all the way east to the Atlantic Ocean at the Hobe Sound beach. It starts (or ends) at the Lake Okeechobee Scenic Trail (LOST) trail head, 2 miles south of Port Myaca and ends (or starts) at the the east end of Bridge Rd in Hobe Sound on the beach. It passes through Jonathan Dickinson state park, Riverbend park, the Loxahatchee Slough, Hungryland Slough, Corbett Wildlife management area, and Dupuis management area. While hiking this trail and passing through these natural areas I’ve noticed that the beautiful scenery and ecosystem is ever changing. Sometimes it seems as though every half hour you’re in a completely different style of wilderness. At times you are walking up and over sand dunes, through oak and palmetto hammocks, cypress swamps, on the banks of canals, or through wet prairies. There are even several pretty boardwalks along the trail to rest your feet. 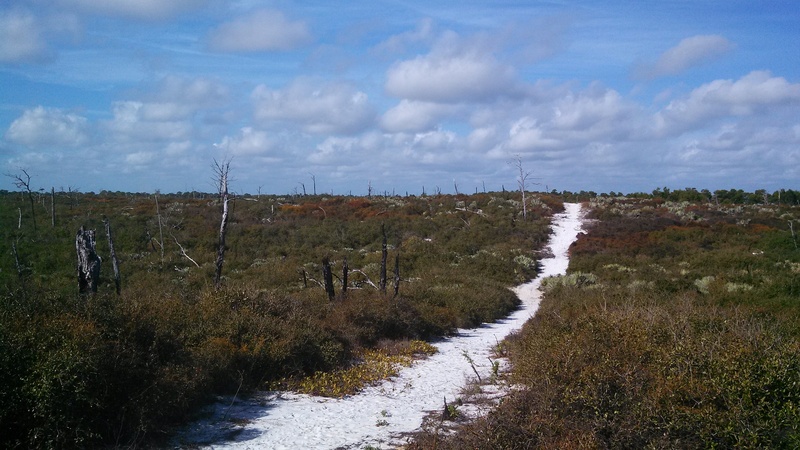 This is a truly beautiful and challenging hike that will give you a taste of what Florida and Florida hiking is all about. The Loxahatchee chapter of the Florida Trail Association maintains 100 miles of trail within this area and that includes this trail. They do a lot of very hard work every year in order to improve on and keep this trail maintained so that we can enjoy it. If you do happen to hike it end to end you should find them on facebook or come to a monthly meeting to give them a thanks and tell them about your journey! They are very kind hard working people and I’m happy to support them where I can and by becoming a member of the Florida Trail Association. When should I hike it? The best time to get out there is from December through early March, in my opinion. The serious trail maintenance is usually finished in February and if my memory serves me right starts in October. This means during those months different parts of the trail is being mowed, clipped, reblazed, and repaired until they finish the 63 miles of trail. From Dec-Feb you will experience the best possible hiking weather and find the trail condition to be in its best shape. Always always always be sure to check the local weather often, days before you head out leading up to the time you leave for the trail. Pay attention to weather patterns and what you might be experiencing during your trip. The difference could mean that you are unprepared for 30 degree cold fronts(it happens) or that it will be raining for the whole duration of your hike. I have experienced both at different times and it certainly calls for a change of gear that I carry and mentality while hiking. The conditions during hiking season are generally very comfortable to hike and camp in and you should have an amazing time during these months. 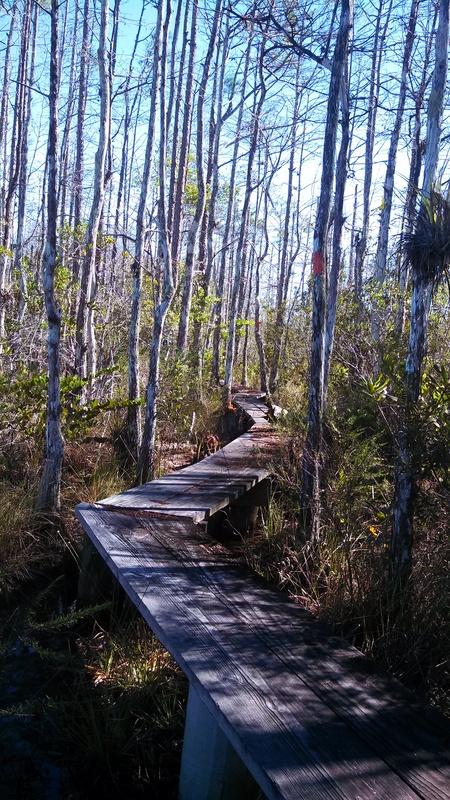 If you do happen to want to hike this trail during other months out of the year… remember that this is south Florida. In the spring and summer you will very likely run into torrential storms daily, hot weather, a 90% flooded trail, and perhaps a trail that has slightly overgrown in the off season. Hike in the off season at your own risk as I don’t advise it. Without proper experience you will likely be more uncomfortable(to say the least) than most would like to be. If this sounds all good and dandy to you then go for it, but you have been warned and I still don’t recommend doing so for a premium experience. A map may be optional but I wholeheartedly think you should get one. The map made by the FTA is extremely useful and you won’t regret having spent the 6 or so dollars it takes to be the owner. The money will also go towards something you know is positive and not some guys pocket, like me. There are a couple of sections that may be confusing if you come across them without. Otherwise I generally think you will be fine if you remember this and live religiously by it…. follow the orange!! By following the orange paint on the trees 95% of the time you are golden. Although I know a lot of hikers like to look at their feet while walking I not only encourage you to look up and enjoy your surroundings, but to also pay attention to the orange blazes and where you are going. A location comes to mind where there is a clearly defined trail in front of you(that leads to a horse trail) yet the OTLHT takes a turn. By following the blazes this is not a problem but there have been many to follow that trail on accident. If you do find yourself either lost or without a blaze to follow don’t be afraid to backtrack to the last one you saw and go from there. It’s better to do this earlier than later to avoid being very far off trail. The map has additional information and includes mileage between landmarks. For free… that’s right FOR FREE, you can download and print a data sheet for the OTLHT. The data sheet offers up mile by mile of the entire trail. Noticeable landmarks, camping, roads, and even the occasional bench or pitcher pump. With this you can gauge how far you’ve gone, where the next campsite is, what your average pace is, etc. I personally bring this sheet with me every single time I hike and wouldn’t be caught without one. It’s truly the most useful information you can have. By looking at this and printing it in advance you can plan out your future trip day by day and see what it takes to hike this trail, by the miles. By not carrying the data sheet you will constantly find yourself wondering where you are and how far it is between here and there. Being that you’re out there to walk, for the most part not knowing these things could mean you under estimate the distance to camp and either have to hike in the dark or set up prematurely. We are blessed to be provided with such important information that keeps our mind at ease on the trail. Should you bring both the map and the data sheet? Yes, I think you should. Be sure to keep both in a dry and safe place as it’s a tragedy when one gets wet or blows away into some canal. The data sheet and map also are made to go together and having both provides even more valuable information. At times there is too much available water, which brings me back to… don’t hike this trail in the summer. Anyhow, yes! You will need some kind of water purification or a filter but there is nearly water everywhere. I use Aquamira which is kind of like a chlorine. Iodine, pump filters, gravity filters, and bleach all work. I wouldn’t recommend drinking the water without filtering it although if you’re in a situation where you need to don’t worry about it. Giardia takes a week or two in order to take effect on your body so you will be long off the trail and have medicine available to you. Quenching your thirst with unfiltered water is far better than being dehydrated and ultimately facing the repercussions. A lot of the water has silt(small particles of soil) in it so first running it through a shirt or a bandanna to “pre-filter” it is a smart idea if its extra dirty. Some filters will clog and stop working if you don’t do this with the really dirty water. Pre-filtering is also nice if you don’t want to drink the “floaties” that inevitably get picked up. I recommend starting this hike with 2 or 3 liters from either direction. Be aware that after a long day sitting in a tree stand some hiker meat starts looking just as tasty to hunters as all the other animals they weren’t able to kill that day……. just kidding. Hunting season to me isn’t something to worry about or not go hiking because of. As long as you are armed with the knowledge that they are out there. I will post a link below to hunting seasons in Corbett and Dupuis. If you are hiking during hunting season it’s not just smart but very important that you wear some sort of brightly colored clothing as a safety precaution. An orange shirt, bandanna, orange vest, orange hat, etc. I have been seen before decked out in all of the above because I decided I had to hike the OTLHT in peak hunting season. I lived and so will you! The hunters know that there are hikers out there but it’s good to let them see you’re clearly not an animal long before you notice them. I have personally run into many hunters on the trail and haven’t felt threatened. They’ve always been nice to me and I try to be courteous by not talking long if at all and letting them continue what they set out to do. We share that space and I sometimes get the idea they don’t have the same respect for the forest as we do but we still must live together. Small game season is one of the safest times as most hunters are looking for a bigger kill in a different season. If you do plan on hiking during general gun season don’t plan your trip in the beginning of the season. Hunters like to congregate and shoot as many animals as they can within the first few weeks of general gun and then they taper off. Again, I don’t feel threatened hiking while they are hunting if I am prepared with my blaze orange hat and red t-shirt. I would hope I look very different from an animal. As I understand it by law they are supposed to spot an animal with a separate scope before even lifting their gun anyway. What are the best campsites? As the saying goes, hike your own hike. All of the campsites are nice in their own way and if it means avoidable pain going to one campsite instead of stopping where you are then by all means deviate from the plan and choose comfort over an excess of pain or walking in the dark. My favorite campsites are as such… Loop 4, Little Gopher, and Kitching Creek. Scrub Jay camp is very similar to Kitching Creek and both are extremely nice and full of amenities like a toilet, trash cans, tables, water pumps, fire rings, and benches. Both of which are in JDSP and you won’t find campsites with more to offer than these two. Little Gopher campsite in Corbett is equipped with a near by canal, ponds, benches, and a fire ring. A beautiful area that I very much enjoy staying at when I can. Loop 4 campsite in Dupuis has tables, fire ring, pitcher pump, and a canal. A fine campsite with many pine trees to set up your shelter underneath and enjoy a meal by the fire. I have also heard that Dupuis is used by amateur astronomers to star gaze, so that’s something to look forward to after night fall. A truly dark sky in Florida. All of the campsites are very nice but those three have always stood out among the others. Bowman Island campsite in Corbett is also very nice and inside of an island surrounded by shallow water. Walking through the water to get to the site is fun as is the beautiful jungle you step into on the path to the back. Something to note about the campsite in the Loxahatchee Slough, Lucky Tract camp, is that there are no ground fires allowed. You may see a fire ring or burnt wood but that was done illegally by people I’m sure didn’t know better. Please refrain from having a fire while staying here. There is also no water at the campsite so 2 miles or a mile before fill up on as much as you can for the night/morning ahead. To camp in the Loxahatchee Slough you will have to call ahead and get permission from Palm Beach County. The phone number is on the Loxahatchee chapter website and I’ll post it below. You will also need to call ahead and make reservations to camp in JDSP. It will cost a few dollars per night but what they are mostly trying to avoid is having a large group already camped there… and then you show up. Both the boyscouts and the FTA use these campsites for large groups and it’s smart to call ahead and confirm you are good to go. This trail can be very wet and you will be walking through water at times. Corbett is a definite, you will get wet area. The Loxahatchee Slough is also very often very wet. This is unavoidable and “water proof” shoes will not be the answer. They will get soaked and then not have the ability to dry out for the remainder of your trip. I personally wear shoes that water has the ability to flow in and out of. Shoes with mesh on the sides that can dry quickly by the fire, overnight, or while I’m walking the next day. I wear trail runners. They’re basically running shoes with a more aggressive tread on the bottom. Serves my purposes perfectly on this and other trails. Having spare shoes to walk through the water is nice in theory but let’s say you’ll be walking in water for a very long time? I think it’s best to embrace it and soon you’ll see it’s actually very refreshing to have your sore feet submerged and cooled down. Gaiters also come in handy. Another way to keep your feet happy. They are pieces of fabric that attach to your shoe and wrap around your ankles closing off the hole where your foot goes in. They keep sand, mud, rocks and other undesirables from entering your shoe that make walking uncomfortable. I wear Dirty Girl Gaiters and they are a low cut fabric that will really improve the way you feel while walking harsh terrain. My favorite piece of gear in the world is an umbrella. I bring my umbrella on every trip I go on and every trip I will ever go on in the future. When mine breaks I will buy another and so on. I use a chrome umbrella that not only sheds off the rain but also provides me with a safe haven from the sun. I have mobile shade and the most breathable imaginable rain protection. On this trail you will find that extra sun and rain protection is a big advantage. In certain areas there aren’t ways of escaping the suns rays and an umbrella will provide you with a fool proof method. Same goes for the rain, an umbrella will give you a place to hide from the rain and still maintain the pace you’re going at or a dry place to rest. A trash compactor bag. That’s right, a big garbage bag… but specifically a compactor bag. Use this to keep all of your gear dry instead of or in conjunction with a pack cover. I only use the compactor bag. What you do is before you pack anything in your backpack put the bag inside and line the inside of your pack with it. Then proceed to pack your backpack but putting everything you want dry inside the compactor bag. When done twist off the end tight and fold it over. This essentially water proofs your backpack and makes it so everything inside stays dry regardless of how much rain you may see. Florida is notorious for random showers in the evening. Be prepared with desirables in ziplocks and your gear in a compactor bag. You can buy a 5 pack for very cheap at any grocery store and they are exceptionally strong. The hardest question there is and there’s no real solution yet. I don’t have any solid answers other than I hope you know someone in the area that can shuttle you back to your vehicle. You can email some Loxahatchee FTA members and see if they can help you or are available. There is a really good chance this would be a good bet. I personally will volunteer as a shuttle as well if we can work out a time when I’m not working I would be happy to do it. Ideally someone dropping you off and picking you up 3-8 days later is the best way. You can park overnight at the LOST trail head and alternatively you can start your hike from inside Dupuis as that’s an even nicer location to leave a car and the Dupuis trails are on the Ocean to Lake map. At Hobe Sound Beach there isn’t a good spot. There is no overnight parking at the beach but I’ve been told that maybe asking a local gas station if you could leave your car there for a few nights and offer money. That might work but then you would have to walk back to your car a mile or two. The best way to get back to your car is to…. hike the trail twice! Then you’ll be where you started and able to drive off into the sunset. Disclaimer: My views and opinions do not reflect that of the Loxahatchee chapter or the Florida Trail. They are of my own and I did not consult them before or after writing this. Contact them with any questions you have. … So happy to come across your blog. The OTL is my playground – well, at least the central portions. I do day trips on the segments between JDSP and Corbett. I have not done a through – nor have I camped out. Transportation issues, of course. … I am one of those crazy people that prefer hiking the trail during the summer months. Yeah, you have to wade through knee deep water. Yeah, it gets so hot and humid that even the flies walk – when they are not feeding on your neck. But the cypress trees are in full leaf, the marshes and swamps are fresh and clean, and the dramatic Florida “cloudscapes” add some visual excitement. … My favorite loop is to park at Cypress Creek, take the connecting trail to the OTL at the river, and then head for Hobes canal. Return is via the Jessup Trail back through Cypress Creek. I hate retracing my steps. …. Anyway, thanks for your blog. I shall be following closely. Great writeup! My son’s turning 5, and we’d love to do an overnighter – hiking maybe a few miles out and back to the car the next day. What would be a dry section (with foliage and trees ideally) to leave the car and head out from? It looks like your photos from sections in Jonathan Dickinson are like this. You have two options. JDSP, you can park by the boat ramp in the far back of the park, and walk the 3 miles to kitching creek campsite. The Rangers up front can assist you with directions. Then there is Dupuis, which is further west but has multiple “family” campgrounds, and a campsite maybe 3 miles out on the loop 2 trail, as well as other sites further out. JDSP would be easier logistically, and there are fire rings, tables, benches, a privy… you see where I’m going. Let me know if you have any questions! Thanks for the quick reply and invaluable info – you appear to be the authority on trails in the area! Now, I’m looking forward to coming up in the coming few months to escape Miami for a couple days. Thanks! Hi. I am an advisor for a Coed Boy Scout Venture Crew from Miami Fl. We are interested in hiking the Ocean to Lake trail in January. Can you suggest any areas to hike where you don’t have to walk thru water? Dupuis and JDSP. I wrote a long response and accidentally deleted it. Oh well. In Dupuis you have a 9 mile hike out to the loop 4 campsite on the west side of the loop, and an 8 mile return on the east side. Park at the hiking trails trailhead, it’s the second gate. You would need a map as there are many other trails in the area. You can find one online or I know they have some at gate 1 of Dupuis by the signs. The loop 4 campsite has tables, fire ring, and pitcher pump. Very beautiful area. In JDSP there is the Scrub Jay campsite, and the Kitchin Creek campsite. Both are nice and have the fixings, a privy, fire rings, pitcher pump, garbage cans, and tables. I forget the numbers for the JD campsites but you have many options for different milages. Let’s say you want to take the long way. Start at the green trail at the parking lot right next to the ranger station. Follow that, and connect it to the white trail, and then to the orange trail. You’ll pass right by Scrub Jay campsite, and if you wish to go further can continue on the orange trail to Kitchin Creek. I think the miles would be something like 6-8 miles to Scrub Jay, and 11 to Kitchin Creek. If short distance, bang for your buck is what you want… you can’t beat an easy 3 miles to Kitchin Creek in JDSP. Drive all the way to the back of the park by the boat docks. Take the trails to the west and follow them past the little wooden overlook, until you see some benches 2 miles in. Go left (west, on the orange trail) across the bridge and eventually on that trail you’ll see a small sign that says campsite. Contact me for more information. The rangers at JDSP are royaly useless(as are their maps,) but they are still worth talking to for a different perspective. Be clear as to what you’re doing. If I were to choose I would go for Dupuis, as I think it’s a much more beautiful area. Not only the campsite, but also the trails leading to and from it. But as I mentioned 9 and 8 mile days. This helped out so much! Thanks so much! I am an avid hiker in Wyoming and actually work in Grand Teton National Park during the summer months on trail crew. I guess I never really thought about hiking trails in Florida, but during a fishing expedition the other day near Hungryland Slough, I saw the map and somewhat read about the Ocean to Lake trail. I am very interested in doing this with my boyfriend perhaps in January. I was just curious as to pacing. How many miles should we hike each day? How many days should we plan on? Just was curious to get your input. We are both very into the outdoors and are very active, so we are able to hike at a good pace but we also want to have time to enjoy ourselves. Thanks so much! Hey I’m re writing this to include more information! I hope I can answer any questions you may have. Anyhow, there are much more beautiful places along the trail than the hungryland slough, but that’s really cool you stumbled upon it! It’s really a hidden gem. Awesome, thanks so much. Do you recommend starting at the lake first? I do. Near the ocean you pass a convenience store and a restaurant 1mile from the finish, and well, ocean! So it’s a pretty good place to end the hike vs the lake is just a trailhead. Thanks for your cool blog & videos. May be that I hike the trail in April 2018. Is april a good month to hike the trail? And is it not risky hiking in the swamp water? There are snakes and gators! Are there known attacks? Thanks for your helpful answer. So I look that I can go in december 2017. How r the bugs what do u do about them? Going to camp on the trail at Corbett both the island and gopher do u use permethrin on your gear? Dose it help just want to be prepared thanks. Any detailed info would help. I made the OTLHT from 01/18.-23/2018 as solo tour. It was a great experience. Came extra from Switzerland to do this hike. The trail was wet but very nice. For preparation your site was very useful, thanks a lot. I bought in Melbourne at zpacks a duplex tent and camped at loop 4 camp, little Gopher, Everglades Youth Camp, lucky hammock and kitching creek. Weather was perfect for hiking, no rain and not too warm. Saw in the woods wild pigs, a lot of nice birds, deer and in Riverbend Park a big gator, no snakes. Hi! I see they moved the location of the maps, but here they are! Hello! This may be a longshot but I am hoping to thru-hike the Florida Trail this upcoming President’s Day weekend (February 16th through 18th) in two weeks. I’m struggling to find an affordable option for parking my car and shuttling back. Any ideas where I can find some information? Thanks a lot!